Our Tea Store features a comprehensive selection to enable you to buy the best loose leaf tea from areas of the world renown for the quality of their teas. 1. Enter the section that interests you most – black, green, oolong, white, flavoured, tisanes or classic tea blends. Details of featured teas and offers are given on the Grey’s Teas Home page. 2. You can browse by section or tag from the drop-down menu in the top navigation bar. Alternatively, you may search for specific teas by clicking on the magnifying glass icon. 3. If you want more general guidance on tea look at the page links in the navigation bar above. At the top of each catalogue page are details of that category of tea designed to give you helpful background information about the teas on that page. 4. Tea samples may be purchased for £2 each. You can choose any tea you wish. 5. Terms and Conditions including shipping charges. 6. Tea Gift Vouchers can be purchased and either posted or emailed to a tea lover so they can choose the teas they like best. 1. Our simply structured Tea Store enables you to discover the teas you are likely to appreciate most. See here for our special monthly discounted teas. 2. Confirm that you want one packet, or change to the number you want. Teas may be ordered in either 125 gram or 250 gram quantities. Some of our most expensive teas can be bought as 60 grams. Continue to add whichever choices of tea you would like. As an alternative to having your teas packed in soft packets you may choose to have your teas packed in tins. These are silver coloured square tin caddies with hinged lids. 3. Orders over £30 are delivered FREE within the UK. Orders to this value are charged postage and packing. We despatch to overseas destinations without shipping charge subject to minimum order values given in our terms and conditions. 4. Card transactions are processed securely by WorldPay or PayPal. We are not privy to card details when you buy online. 5. Should you wish to order by telephone we would be happy to advise which teas you may like best and we would be happy to process your transaction manually. 6. Please press ‘Order’ when the checkout has been completed. This will trigger an automated order confirmation email to be sent to you. 7. You will receive a separate transaction confirmation email from WorldPay or PayPal. 1. We will send you a receipt of your order. WorldPay will send you an e-mail confirming your transaction. 2. We endevour to despatch same day or next working day. 3. Your order is packed specially for you. 4. We send you an e-mail confirming despatch of your order. 1. 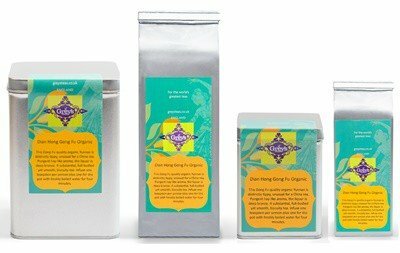 Your is packed in individually chosen packets of tea, packaged in silver, triple laminated bags – cellophane, foil and paper – with full colour labels as shown. They are resealable to ensure continued freshness. You may choose silver hinged tin caddies if you wish. 2. Should you wish, we will send you our free guide to our tea. 3. No junk e-mails. Your contact details remain confidential with us. 4. We state a ‘best before’ date one year from date of despatch. Black teas will not deteriorate for a considerable period after this. Green teas are more perishable and should be consumed by the date given for them to be enjoyed at their best. Tea should be kept cool and dry in an air-tight container away from light and strong smells. Gift Wrapping. If you wish to make a gift of our teas we can wrap them specially for you and send them with a special tea themed card with a greeting of your choice. You can choose to have your order sent to an address different to your billing address. Just follow the instructions during the ordering process. Tea Collections. Should you be uncertain which teas to give may we suggest that you have a look at our tea collections. These comprise four carefully chosen teas in caddies. They are available in ten themes. You are welcome to visit us at Wootton Wawen. The easiest way to pay is using our link with PayPal.